Is 2019 Calling for the Death of ICOs? With the sheaf of disparate startups coming up to light, it’s getting tougher to detect the genuine ones. Jason Cohen had once quoted, “It’s more effective to do something valuable than to hope a logo or name will say it for you.” Hence, we cannot judge or comment upon a company’s progress solely depending upon its hype or revenue generation. To know where a company stands, it’s necessary to take into account a bunch of other offbeat factors furthermore. The funding, business model, ideas, team, and timing are the factors which hold a potential to make the startup revolutionize a marketplace thereby leaving a lasting impact. The investors need to make sure they are investing in experience. They need to find people smarter than themselves. A startup that is comfortable with any kind of change and has all its hands on the deck to execute its vision is more or less unfeigned. There are many Initial Coin Offerings going on in the market today. Only a quarter of the ongoing year is left, so let’s quickly have a look at the funds already raised by the ICOs of 2019. It’s quite hapless to note the wretched state of the ICOs this year. 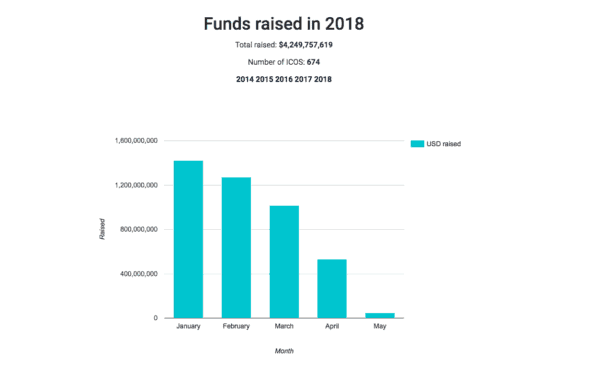 As we can see from the monthly-recorded chart above, the funds raised by the ICOs have declined from about $1.423 billion in January 2018 to approximately $533 million in April 2018. Talking of the most successful ICOs, there are startups to have raised over billions in a minute! That is how crazy the world of ICOs is. There is no doubt that ICOs have changed the financial landscape over the past 2 years. However, these farcical success booms have just made us look over the facts through a rose-tinted glass. Factually understating, about 99% of the ICOs taking place, tend to fail. Last December, the value of bitcoins soared to 20,000 USD, following which the price was dropped by 70% in the initial months of 2018. The Greater Fool Theory economically states that the price of an object increases not because of the value that it brings in but because of the irrational beliefs attached to it. Applying the same to ICOs, you have a bunch of decentralized applications and currencies coming up which are bringing in nothing new to the ecosystem. Cryptoeconomics: It is funny how most developers forget thecryptoeconomics of their ICOs. It is literally the combination of “cryptography” and “economics”. While most developers pay attention to the cryptography part, they hardly pay any attention to the “economics” part. As a result, it is very rare to find a token whose economic skeleton has been properly and thoroughly mapped out. Utility: Utility is the total satisfaction gained by the consumption of goods or services. Most of the ICOs do not maximize their token utility. The tokens should be absolutely integral to the ICO and must increase the overall value of the final product. If you do use tokens for your business, then you need to completely understand its role and maximize its utility. Security: During and immediately after the ICO, there’s a big target on your back. If the security isn’t paid attention to, hackers will attack and rob you. Chainanalysis unerringly say, “More than 30,000 people have fallen prey to ethereum-related cyber-crime, losing an average of $7,500 each, with ICOs amassing about $1.6 billion in proceeds in 2017.” In fact, there seems to be a 1 out of a 10 chance that you will end up being the theft victim. A faulty code, few phishing schemes or, the mismanagement of keys can be the other reasons adding on to the stumbling security. Back in December 2017, the value of bitcoins soaring to a 20,000 USD, led to a steep drop in its price by 70% which affected the initial months of 2018. As a result, a lot of altcoins started being issued through the ICOs. Although altcoins or alternative coins resemble Bitcoin in the way they’re designed, most of them serve a different purpose than just being a financial tool. The vast majority of altcoins doesn’t do anything special at all as they just try to mimic a Bitcoin with little tweaks. Some, on the other hand, has been designed with a purpose of becoming a worldwide computer and can be used as a platform for building decentralized applications. Many critics have contended that these altcoins can be easily manipulated on exchanges as they are created in a small supply at the beginning of the ICOs. This manipulation is generally done by the founders who entrusted to the pre-ICO period or by the early eminent buyers. Ultimately when the coins hit the exchanges, the founders and other early investors are known to have blatantly washed the traded the tokens back and forth between themselves under minimal regulations, thereby kicking off a pump to create an illusion of demand for the coins. Some founders can easily disburse the funds raised in ICOs on some hype-creating campaigns instead of on the actual product development. Coin founders build the social media hype before releasing the coins onto exchanges. Many ICOs state that the startup holds zero obligations to its investors. VitalikButerin, the inventor of the most used altcoinEthereum, proposed an improved model of ICOs in January called the DAICOs. DAICO models enshrine greater investor involvement, a gradual release of investor funds to companies and powerful voting rights. Unfortunately, scarcely some companies have opted to do DAICOs in place of ICOs. Numerous experienced cryptocurrency influencers are trying to make more companies adopt this new model. This might help overcome the already discussed wretched state of the ICOs. “If you’re having trouble picturing it: Imagine that a friend is building a casino and asks you to invest. In exchange, you get chips that can be used at the casino’s tables once it’s finished. Now imagine that the value of the chips isn’t fixed, and will instead fluctuate depending on the popularity of the casino, the number of other gamblers and the regulatory environment for casinos. Cost goes before the profit. A wise man once said, “The rich invest in time, the poor invest in money”. Take time if required. But never fail to choose the right ICO to invest on.